Volunteers under the age of 15 must be accompanied by an adult. If you are under 15, please have your parent or legal guardian fill out an application for themselves and indicate they will be bringing you. Please check all that apply. Don't worry, you will determine how frequently you want to volunteer. This gives us a sense of which programs may work best for your schedule. It is the policy of Our Neighbors’ Table that its Directors, Staff and Volunteers will not disclose to the general public any personal information concerning guests, former guests, staff, volunteers or donors without their written permission, except as authorized by the Executive Director. (This does not include emergency situations when it may be necessary to summon the police or medical assistance.) 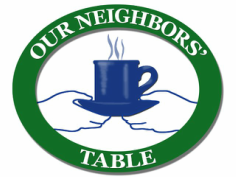 Directors, Staff & Volunteers are free to talk about Our Neighbors’ Table and its programs and services, but they are not permitted to disclose guests’ names or to talk about them in ways that will make their identity known. Care shall also be taken to ensure that unauthorized individuals do not overhear any discussion of confidential information and that documents containing confidential information are not left in the open or inadvertently shared. Directors, Staff and Volunteers are also not permitted to disclose or discuss confidential financial information pertaining to Our Neighbors’ Table without permission or authorization from the Executive Director. Failure to adhere to this policy will result in discipline, up to and including separation of employment or service with Our Neighbors’ Table. I have read Our Neighbors’ Table Confidentiality Policy. I agree to abide by the requirements of the policy and inform the Executive Director and/or the Compliance Officer immediately if I believe any violation (intentional or otherwise) of the policy has occurred.